Nov. 17, 2017, 9 a.m. The Guardian revamped its ask and its membership offerings — moving from 12,000 members in the beginning of 2016 to 300,000 today. By Christine Schmidt @newsbyschmidt Nov. 17, 2017, 9 a.m. Instead of using tote bags, tickets to live events, or other swag, The Guardian‘s membership program has grown to 800,000 supporters a year and a half after doubling down on its membership initiative. The key? A shift from a commercially focused plea to an emotional, service-based request, the two women leading the effort said. Financial difficulties struck The Guardian, the London-based, trust-owned international news organization, in recent years, with the print-to-digital advertising downturn that wracked news industries around the world. It had also taken on an ambitious plan to expand internationally following its coverage of Edward Snowden’s NSA files and subsequent Pulitzer in 2014. That ambition didn’t quite follow through — Buzzfeed reported in June that “the thirst for global expansion was so strong, in fact, that the Guardian’s former US CEO says he was pressured to make unattainable business projections to fuel the growth.” Those figures included $15.5 million in revenue from April 2015-16 amid more than $15 million in operating losses with a revenue target of $32.2 million for 2016-2017. Faced with the heat of digital advertising and ad-blocking software, the Guardian focused on shaking things up. “Will it be a wall between the reader and the content? No, it won’t be. It’ll be adding more value for people who want to get more involved in the Guardian, who feel passionate about the Guardian. In January 2016, The Guardian re-emphasized the potential of the membership program while embarking on cutting spree of 20 percent, about 50 million pounds, from its budget over three years. The “enhanced membership offer” aims to double reader revenues, according to a Guardian press release detailing the cost-cutting breakdown. Around this time, “a small cross-functional team made up of editorial, commercial, UX and engineers began to reimagine what the membership scheme could be when rooted in the Guardian’s journalism,” Michel said. She and membership executive editor Natalie Hanman transitioned within their Guardian roles to focus on membership. (Michel had joined the Guardian in 2011 as open editor, bringing her experience from ProPublica and Huffington Post with skills in community engagement, and Hanman was editor at the Guardian’s opinion site.) Twelve thousand members had already signed up, but the membership system largely centered on in-person events — not exactly encouraging anyone outside of London to become a member. By the end of 2016, reader revenues — that’s memberships, subscriptions, newsstand sales, and one-time contributions — comprised more of the Guardian’s revenue than advertising dollars did. Last month, editor-in-chief Katharine Viner announced that financial support from readers had officially surpassed advertising revenue, noting that 500,000 individuals contributed monthly to the Guardian as members and print/digital subscribers and another 300,000 one-time donations have added to the organization’s coffers. “We are encouraged and cheered by the hundreds of thousands of you who are supporting our journalism. In the last year alone, the number of readers who support us regularly has more than doubled, and we now receive more income from our readers than we do from advertisers. 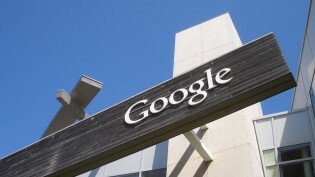 This is a significant step,” Viner wrote. In its infancy, the membership program had invited readers to become “friends” for free while paying for events, “partners” for £15 (US $19.79) per month with discounts to ticketed events, and “patrons” for £60, with the aforementioned discounts and access to Guardian newsroom events. 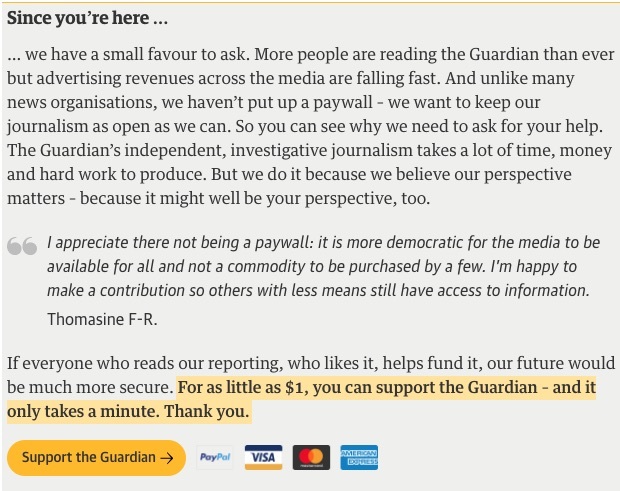 Now, however, readers can join as “supporters” for £5 per month with ticket access, “partners” for £15 per month that includes tickets to Guardian Live events or Guardian-published books and a welcome gift, or “patrons” or £60 per month with the other benefits plus access to “exclusive, behind-the-scenes” events. But Michel and Hamnan credit the events for catalyzing change and restoring energy to the membership drive. Because readers outside of London didn’t have much incentive to attend Guardian events at the newsroom in the city and the Guardian was making this international thrust, it didn’t make sense to push that as central to the journalism organization’s pitch when readers and reporters, editors, and designers could interact in more multidimensional ways. The pair revamped both the ask and the offerings — moving from 12,000 members in the beginning of 2016 to, today, 300,000. A surprising number of readers also didn’t understand the financial struggles plaguing print journalistic organizations of all sizes, Hanman and Michel said. By placing an appeal on the Panama Papers articles in April 2016, “we were really drawing that link between time and effort and skill we put into that investigation, working with these organizations around the world, and asking people if you value this please contribute toward this,” Natalie said. Aside from intricate investigations like the Panama and the more recent Paradise Papers revelations, the Guardian’s membership spiked following coverage on the environment, Brexit, and the U.K. election. Some members even double-dipped and made more donations as new reporting emerged. Engagement with Guardian members includes a weekly newsletter to supporters, a weekly “behind the scenes” story production series, a Q&A with a columnist, and even a podcast based on supporters’ calls and questions. Hanman and Michel said the next goal is not based on reaching another metric milestone, but on delving further into reader relationships. “The last year has really been a foundational year,” Michel said. “It’s about creating a network of colleagues across the Guardian to develop essentially a shared experience and expertise. Now that we have the foundation we can start becoming more creative. 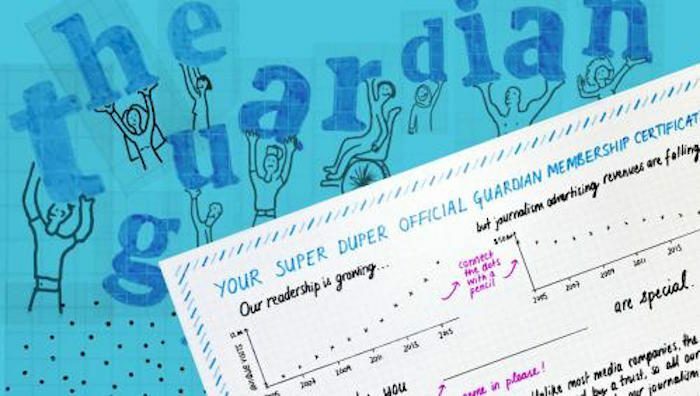 Image of the US Guardian membership certificate by Mona Chalabi used with permission of the Guardian. POSTED Nov. 17, 2017, 9 a.m.
Schmidt, Christine. "Asking members to support its journalism (no prizes, no swag), The Guardian raises more reader revenue than ad dollars." Nieman Journalism Lab. Nieman Foundation for Journalism at Harvard, 17 Nov. 2017. Web. 18 Apr. 2019. Schmidt, Christine. "Asking members to support its journalism (no prizes, no swag), The Guardian raises more reader revenue than ad dollars." Nieman Journalism Lab. Last modified November 17, 2017. Accessed April 18, 2019. https://www.niemanlab.org/2017/11/asking-members-to-support-its-journalism-no-prizes-no-swag-the-guardian-raises-more-reader-revenue-than-ad-dollars/.